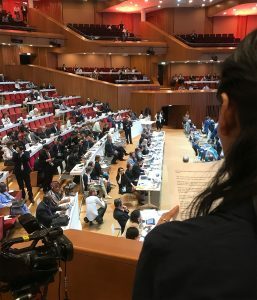 Tenzin Choekyi reads ICT’s statement at the UNESCO Committee meeting while Chinese delegates below the balcony celebrate the inscription and take photographs. 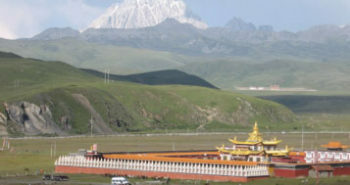 China’s official nomination proposal for this vast area of Qinghai, twice the size of Belgium, required UNESCO World Heritage Committee members to accept a framework that specifically labelled traditional pastoral land-use a threat, involving the criminalization of traditional productive and sustainable activities as pastoralism and gathering medicinal herbs. 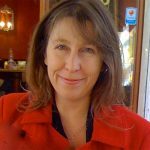 It involved tacit acquiescence with China’s ambitious and elaborate state-engineering policies that are re-shaping the landscape of the world’s highest and largest plateau – notably, the removal of Tibetan nomads from their land. Tibetan nomads have protected the land and its wildlife for centuries, and are responsible for Hoh Xil being recognized as World Heritage in the first place. Their essential involvement as stewards of this vast landscape in order to maintain the long-term health of the ecosystems and the water resources that China and Asia depend upon is acknowledged by grasslands experts and scientists within the PRC, as well as internationally. There is a consensus that indigenous stewardship and herd mobility are essential to the health of the rangelands and help to mitigate climate change. So ICT went to Krakow to speak on behalf of the nomads. Together with Tenzin Choekyi, a skilled Tibetan advocate who studied Tibetan pastoralism and Chinese grasslands policy, we talked to Ambassadors, staffers and international NGOs both in UNESCO offices in Paris beforehand and directly at the Committee itself. We made a presentation at a global Civil Society Forum in Krakow organized by Berlin-based NGO World Heritage Watch before the opening of the UNESCO meeting. After Choekyi spoke about the implications of unexamined inscription of Hoh Xil at the NGO Forum in Villa Decius (a stately former Renaissance palace that now hosts cultural dialogues), the room fell silent. It was clear that few had grasped the significance of China’s nomination. While the Chinese government flatly denied that it had relocated any nomads from the ‘property’, our research gave reason to assume that China had indeed removed Tibetan nomads from the area prior to making its World Heritage bid (detailed in ICT’s report). International conservation body the IUCN also stated in its evaluation that the Chinese state party would seek to move those remaining into different types of work. 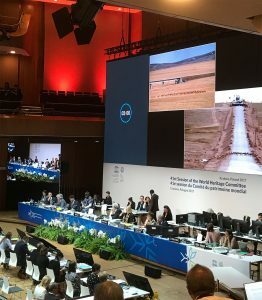 Images of the Hoh Xil area showing Tibetan antelope crossing a road at the UNESCO Committee meeting. IUCN also admitted that local people had expressed concern to them about relocations – a significant acknowledgement, given the dangers faced by Tibetans or local Chinese people who dare to raise even moderate concern about projects prioritised by the Beijing leadership. The Chinese government does not allow Tibetans or other ‘ethnic minorities’ to express views that are different to those of the Party state, and this is a high-profile project which matters to Beijing. We argued that for these reasons and others, inscription of Hoh Xil without further assessment contravened both UNESCO and IUCN guidelines, including the principles of FPIC (free, prior and informed consent) and UNDRIP (UN Declaration on the Rights of Indigenous Peoples) which are recognised in UNESCO Operational Guidelines. 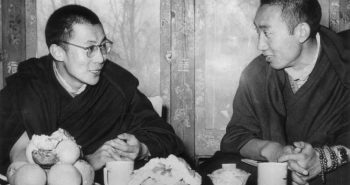 Privately, many officials expressed their concern and support, but no member of the Committee was prepared to volunteer any formal amendments to the language of the nomination seeking to guarantee that traditional nomadic life of Tibetans must be respected and guaranteed in the nomination document as a precondition for the inscription, including a land use plan that establishes the right of Tibetans to graze their animals. UNESCO’s brand equity is highly sought after; Tibet has become a major destination for Chinese tourists, with official (and inflated) statistics stating that by the end of 2020, the number of annual visits to Tibet should reach 20 million. According World Heritage status to Hoh Xil, a wild landscape between Lanzhou and Xining, on the way to Lhasa, will contribute towards a strategy that identifies ‘safari tourism’ as a key area for expansion. An Economist article last week drew attention to the new popularity of ‘glamping’ for Chinese tourists in wilderness areas – with tourists staying in luxury yurts or nomad tents as the authorities settle nomads across the PRC. 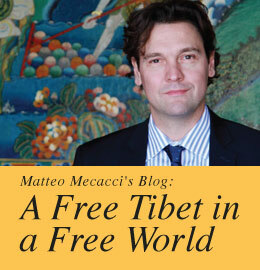 We also pressed for the mapping and description of sites of sacred and cultural importance, with free access to the sites as well as the freedom for Tibetans to practice their religion there. The latter would have supported an innovative approach being developed by some Tibetan environmentalists working on a bid to have the Hoh Xil and Sanjiangyuan areas declared as a Sacred Natural Site (SNS) under Tibetan community control, in direct contrast to the nomination by China to UNESCO. This is a category that has no official status, although the IUCN concept of an ICCA, an Indigenous or Community-Conserved Area, is similar. It is linked to a more widespread promotion of ‘sacred’ landscapes as a means of conserving nature and culture. (See for instance http://sacrednaturalsites.org/items/the-sacred-natural-sites-of-kham/). When the nomination was overwhelmingly approved, the large Chinese delegation were jubilant, to the extent that the Polish Committee Chair Dr Jacek Purchla had to advise the Committee that there was a specific area for delegates to celebrate approval of nominations, and that was outside the hall, not inside. The eventual outcome makes it all the more important for ICT to continue its advocacy, in partnership with Tibetan advocates. The controversy over Achen Gangyap (Hoh Xil) went global; it was covered in the international media from the New York Times to the BBC. IUCN, in its statement in Krakow, also explicitly referred to “international rights norms” that need to be observed with regard to Tibetan herders and pastoralists, which acknowledges the broad significance of human rights principles for land-use policies, an assurance that was something ICT had pressed for. The work must continue to help ensure that Tibetan pastoralists are protected, and to seek to support Tibetan conservationists in their skillful work at a grass roots level wherever possible.